Like The Unquiet Heart, this novel is set in 1946, in the aftermath of the war, but while that one opens in a sleazy London pub then whisks the reader off to Berlin,the opening scene of this story takes place in Beverly Hills, where ex-OSS operative Minor Jackson is at a very loose end. So loose that when he rescues a Romanian dwarf from drowning in a swimming pool in (actually from being drowned by a laughing group of full-size oafs) and the dwarf, Ploscaru, subsequently shows his gratitude by offering to let him in on an almost-legal deal that will make them a pile of money, Jackson doesn’t hesitate. It transpires that the father and sister of a certain Kurt Oppenheimer want him found and restored to them. The Oppenheimers are a rich Jewish family who escaped from Germany before the War, but Kurt insisted on remaining behind and doing something. What he did was become a highly-skilled assassin. Great. The problem is that now, after the War, he is still killing Nazis; and not only his family but everyone else wants him found. Which is easier said than done because Kurt is a master both of languages and accents and of disguise. A gripping story, post-WWII in vivid detail, and a wealth of characters, many of them so unforgettable that you forgive the author the slight confusion that now and again sets in. Also, I have to say that if I had been writing this book, the ending – which I do not want to reveal – would have been different. 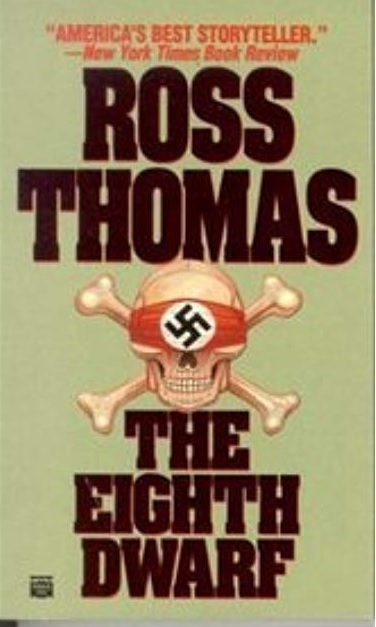 But that is because I am still (a little) starry-eyed, whereas Ross Thomas was definitely a cynic. A very humorous one, however, and a master of his art. The Eighth Dwarf (yes, the other seven are Snow White’s ones) is out of print (absurdly, in these days of Print On Demand) but it is available on Kindle or you can find a copy of the paperback at Abe Books.